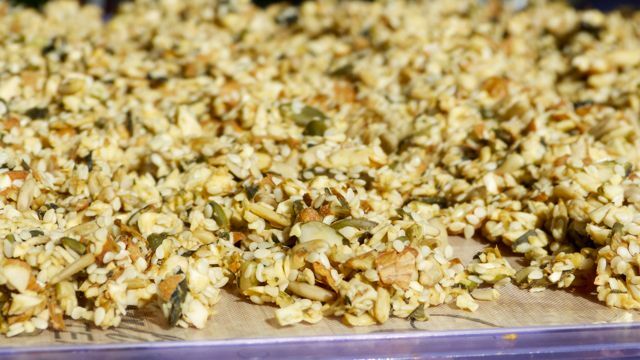 Here is a recipe that will feature in our first Primal Seasons Spring Workshop this October. I’ve found it in Hugh Fearnley-Whittingstall’s fabulous book: The River Cottage Year. It’s in the April chapter. The sorrel I found in our garden, purposefully planted in the wettest area of our pumpkin patch. So far only the chickens and our sheep were interested in it. That changed tonight when I made this marvelous soup. Be warned! This is a very filling meal. I had multiplied the recipe to accommodate a dear friend who had joined us for dinner. That was unnecessary, we found out. Hence I changed the “Serves” from 2 to 3. Wash the sorrel well and trim off any particularly coarse stalks. Melt a knob of butter (25 g) in a saucepan over a low heat and add the onion, leek and carrots. Sweat gently for about 5 minutes, so the vegetables are slightly softened but not coloured. Add the chicken stock and the long grain rice. Bring to the boil and simmer until the rice is completely tender, about 15 min. Ladle the soup into a blender, adding the raw sorrel, the remaining butter and the double cream. Blend until completely smooth (depending on the capacity of your blender, you may have to do this in two batches). Return the soup to the pan, reheat thoroughly without boiling and adjust the seasoning with salt and pepper. Poach the eggs one at a time. Break each egg (which should be at room temperature) into a cup, being careful not to break the yolk. Bring a small pan of lightly salted water to the boil. When it is boiling rapidly, stir fast with a large spoon to create a vortex. Pour the egg into the centre of the vortex, place the lid on the pan and turn off the heat. Leave for exactly 2 minutes. Serve the soup in a warmed bowl with the drained poached egg in the centre and an extra little blob of cream beside it. Better pictures will follow. Promised! Here is another Classic – that had escaped my attention until I came acroos Fergus Henderson’s and Justin Piers Gellatly’s “The Complete Nose To Tail” cook book. A Must-Have, like Julia Child’s books! 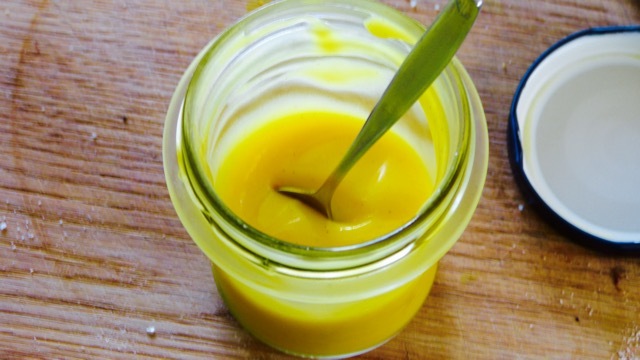 Being blessed with 15 chooks and a rooster, meaning: a constant supply of fresh eggs, 14 bee hives, abundantly producing lemon and lime trees and a love for good butter, what else to make but Lemon Curd?! It has become a staple in our kitchen. Place the lemon juice and zest in a large heatproof bowl with the butter and honey. Set the bowl over a saucepan of simmering water, making sure the water doesn’t touch the base of the bowl. Leave until the butter has melted, stirring occasionally, then whisk in the beaten eggs. Cook in that bowl for about 10 minutes, whisking every 2-3 minutes, until the lemon curd has thickened. Watch the simmering water to make sure it doesn’t boil rapidly or the eggs will curdle. Once the curd has thickened, strain it through a ﬁne sieve, then fill into clean jars and seal. It will keep for up to 3 months in the fridge. Ever wondered what magic your grandma was putting into those jars when you were growing up? I have. …and never really investigated until now. Living on the opposite side of the world now – where people hang upside down – no written records could be found either. Not that I would have been able to read my grandmother’s old German handwriting. What helped was this marvellous hande-made stone pot, which Babak imports from Iran. 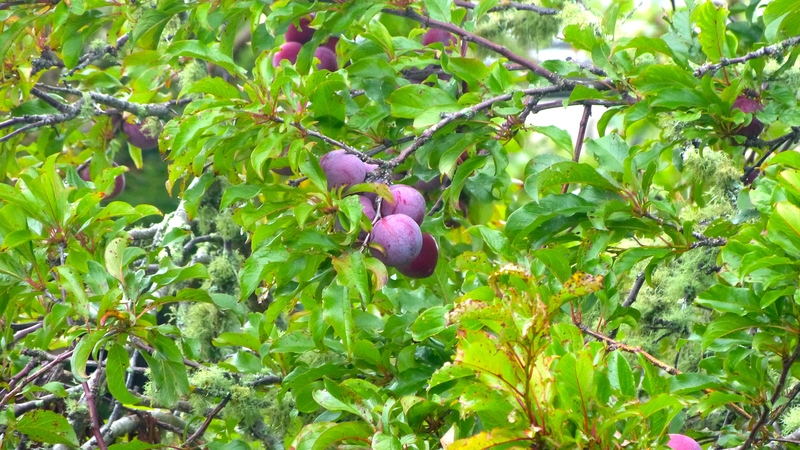 Google came to the rescue when my neighbours plum tree was dumping a ton of fruit on the lawn. Add New Zealand plums, a faint memory of childhood Bliss, a ‘googled’ a.k.a. ‘researched’ German recipe, and a Persian stone pot and voila! 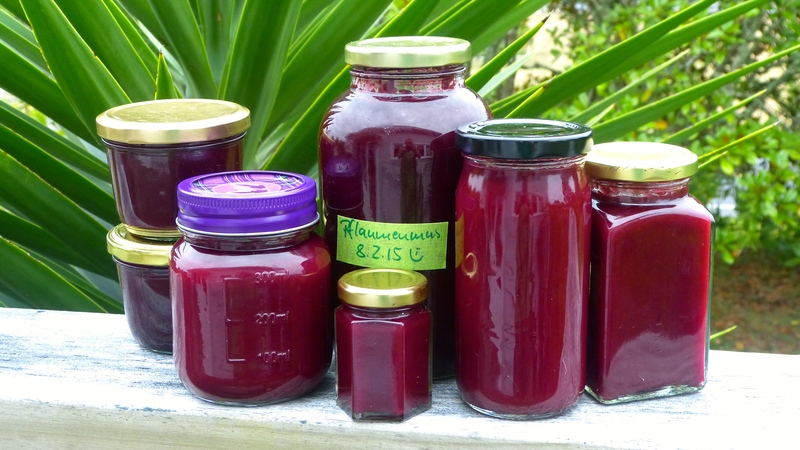 There it is: A perfect plum jam/Pflaumenmus that comes very close to Grandma/Oma Lieselotte’s magic! Just in case you don’t have a Persian stone pot, get one! Haha! Of course, you can probably use your ‘Roemertopf’, still remembering its 1970’s glorious days. A good old (and boring) baking dish with lid will highly likely do the trick too. You can get these pots in Auckland, NZ, from the Wise Cicada in Newmarket or Farro Fresh. The original recipe was with brown sugar. I took the freedom to replace it with organic coconut sugar. Have also ramped up the variety of spices. The apricot kernels are there for some bitterness. I remember the highlight of my grandmother’s ‘Pflaumenmus’ always was the whole walnut in each jar. They were delicious when you opened them after they had months to marinate in plum aroma. 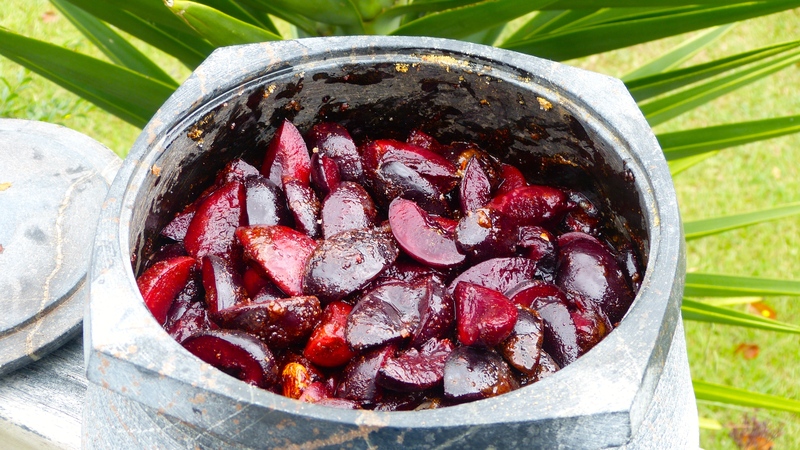 If you have fresh (mold free) walnuts, make sure to bake them with the plums to sterilise them. 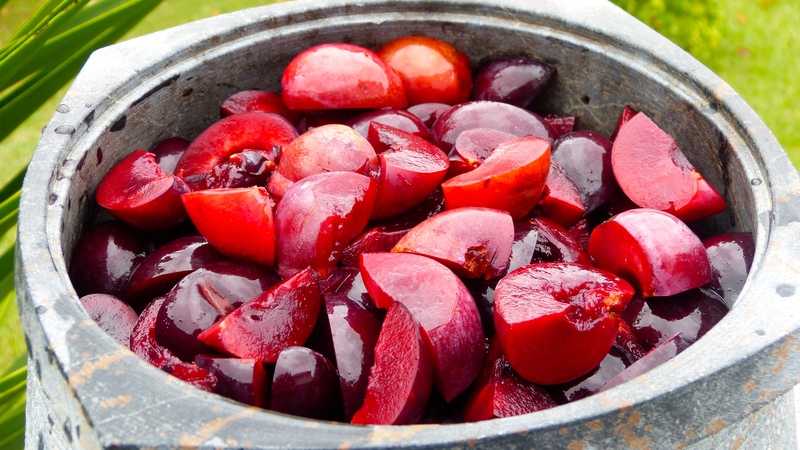 Remember to fish them out temporarily while you puree the plums with your hand mixer! Back in they go afterwards. Clean the plums, half them and remove the stones. 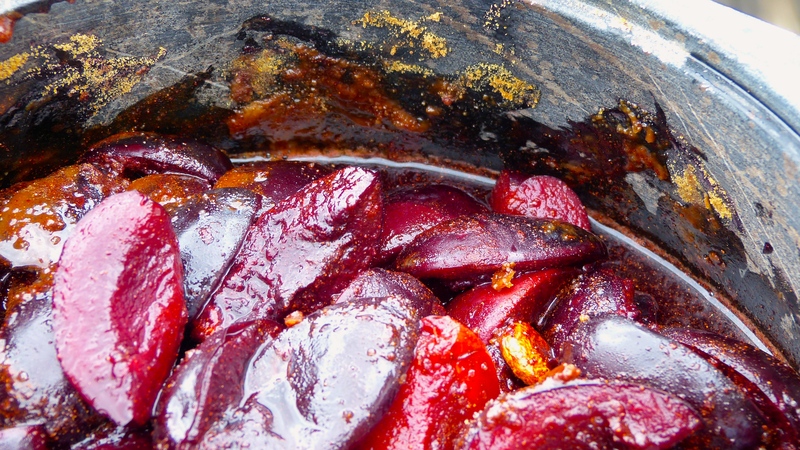 Toss the plums with the sugars and ground spices. 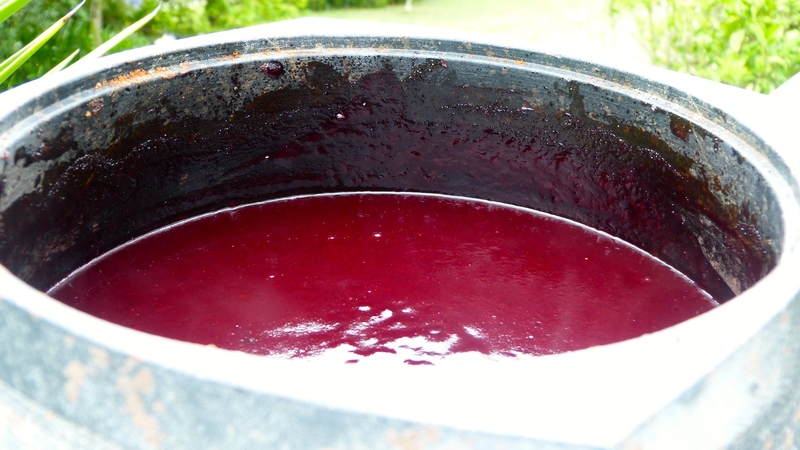 Put into a stone pot or baking dish and let sit for 2-3 hours to release some of the juice. 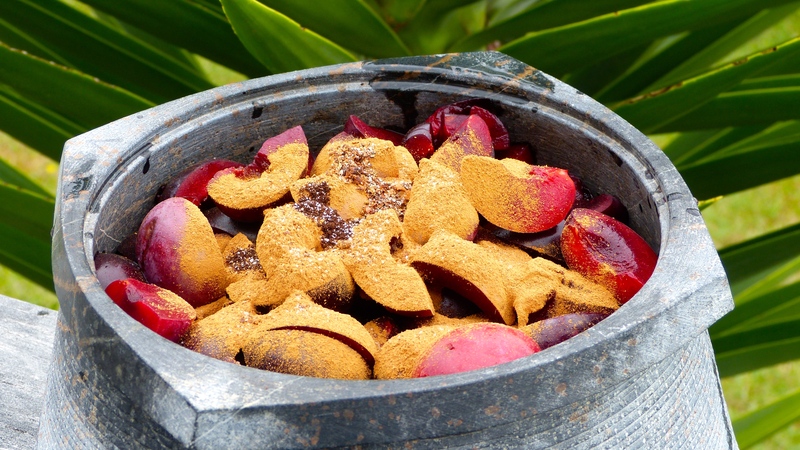 To save time you could also boil the plums with sugar and spices in a pot to realease the juice. If using a stone pot put it into your oven, leave the lid off the pot, but in the oven, so it warms up too. With your oven set to Baking or Fan Baking start with 120°C for 20 minutes. Increase the temperature every 20 minutes by 20°C (total 60 min) until you reach 180°C. Now put the lid on your pot and bake (no fan) for another 60 min at 180°C. 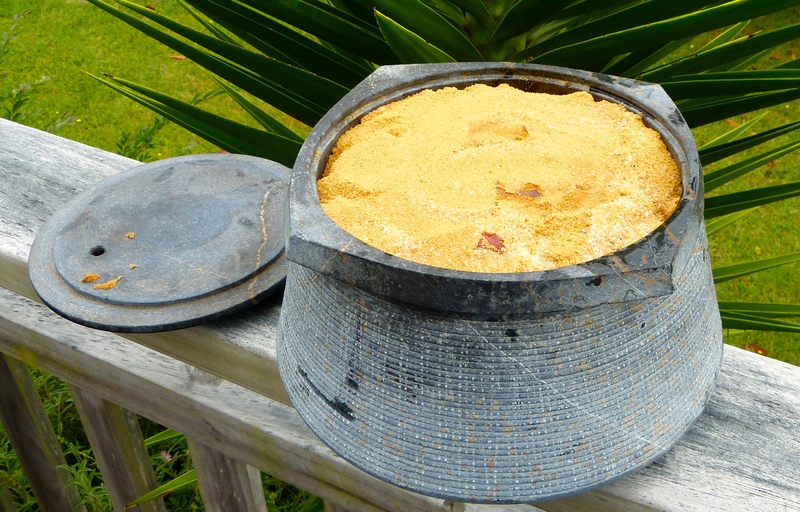 This will allow your stone pot to heat up evenly without running the risk of cracking. The fan in the first hour will allow a good portion of water to evaporate, which makes for a thicker jam. At the end of the baking time carefully lift out your hot stone pot. Place it on a heat resistant and stable surface. Now puree the plums with a stick blender into a smooth consistency. Remember to fish out the whole walnuts before blending – if you use that variation! 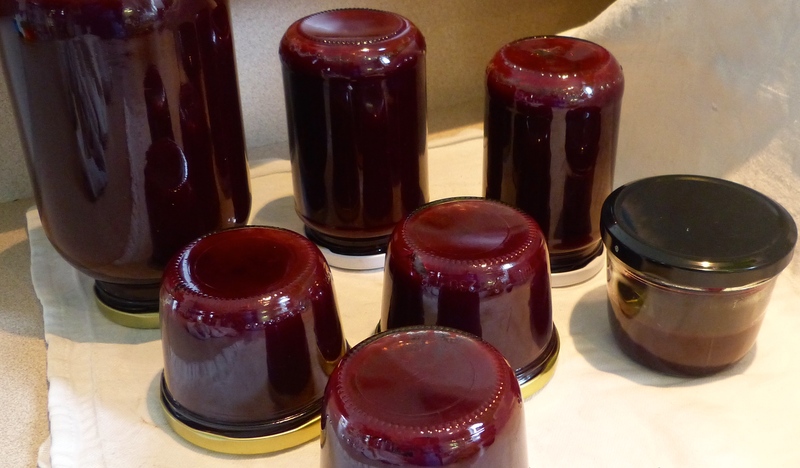 Fill the jam into hot rinsed canning jars. Turn the closed jars onto their lids and let cool down. Having the jars cool upside down will increase the percentage of properly sealed jars drastically – especially when using recycled ones. Will keep in your pantry until discovered by your family. Now get yourself a slice of freshly toasted rye sourdough bread or grain-free almond bread with a decent LAYER of butter (wait a bit or your butter will drip!) a spoon… I’m sure you get my drift. 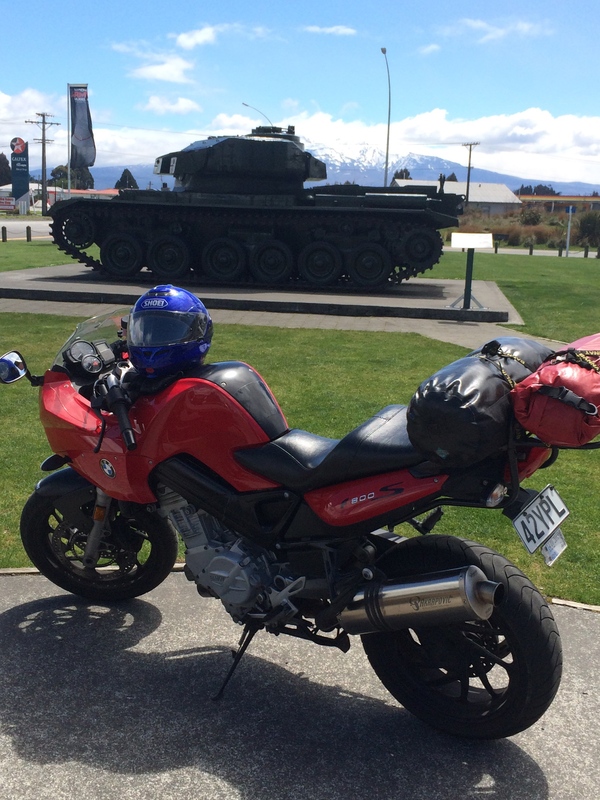 The summer is performing at its very best here in New Zealand. Time to brew some refreshing drinks! Yes, beer has been made with freshly harvested stingy nettles earlier this summer, thanks to Amy McComb of Plantrhythms! Want the recipe? Let me know by dropping a comment below! Back to our low alcoholic treat. I found the inspiration for this one while listening to the audio version of Sandor Ellix Katz’ book: The Art of Fermentation – driving my new pony home to Warkworth from Wellington. 11 hours of fermentation wisdom pouring into my ears while crossing the beautiful North Island of NZ. By the time I got home I was ready for a cool drink and a massage. I’ll leave you to figuring out the details of the massage and provide the recipe for the drink. This recipe works well year round with organic frozen berries. Any kind of berries will do, as long as they are organically grown. 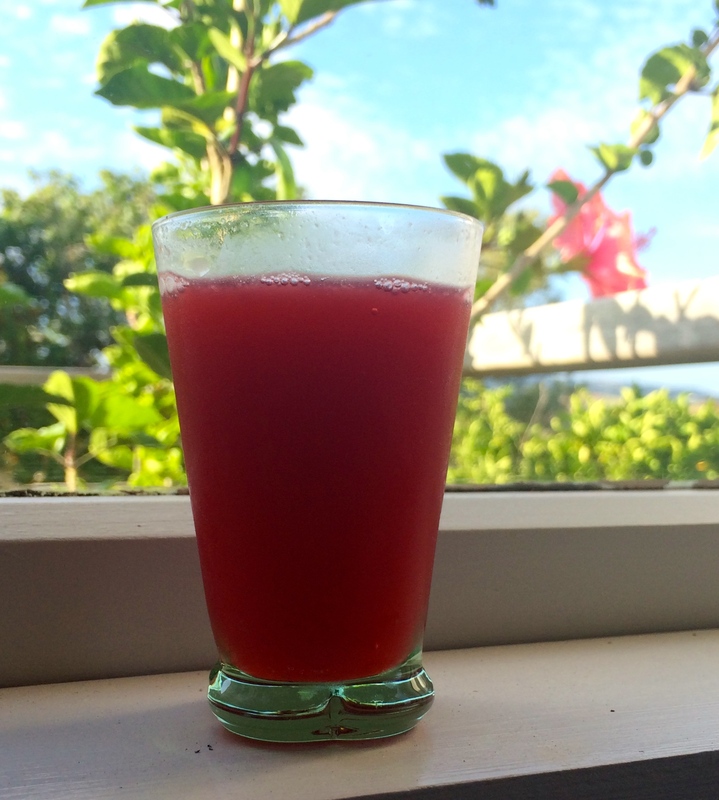 I’ve so far experimented with raspberries, blueberries, blackcurrants, strawberries, acai – all with great results. If you happen to have an abundant supply of fresh berries, you might get away without adding any cultures to start the fermentation process, as there usually are plenty of wild yeasts living on unsprayed berries. I used frozen berries and added the whey from my milk kefir (Vegans beware! ), a splash of Kombucha and some Coconut Kefir. 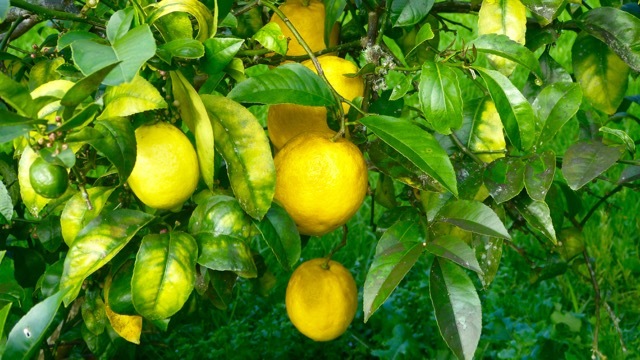 Originally home-made lemonades were made just with whey. Milk Kefir provides a higher percentage of yeast strains that will happily start an alcoholic fermentation, in comparison to for example: Caspian Sea Yoghurt. For any of these cultures, please get in touch with your local Weston A. Price Foundation chapter or drop me a line here. 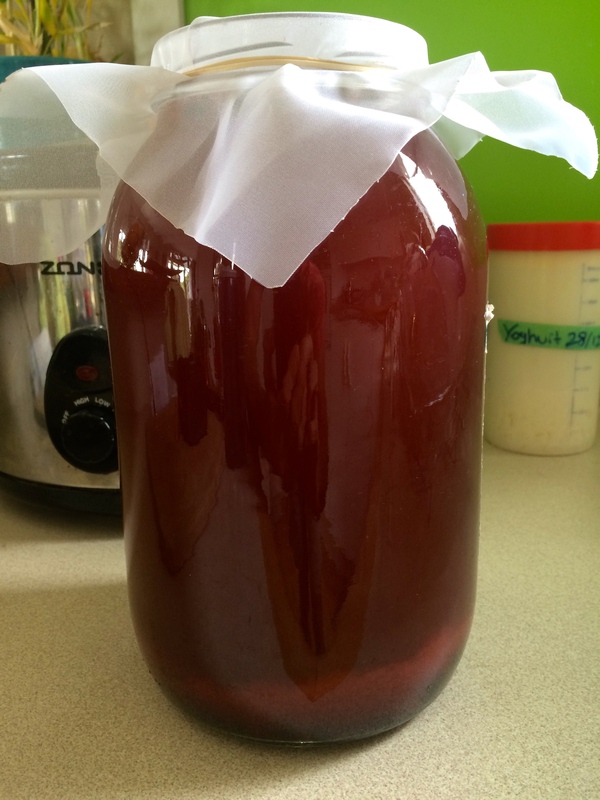 The reasoning with adding more than one starter culture was to get a more vibrant fermentation going fast. In my opinion, it will also provide the limonade with a richer pro-biotic profile. Yes, you can leave out the kefir whey if you don’t tolerate milk products. In that case I suggest you stick to Kombucha and Coconut Kefir. 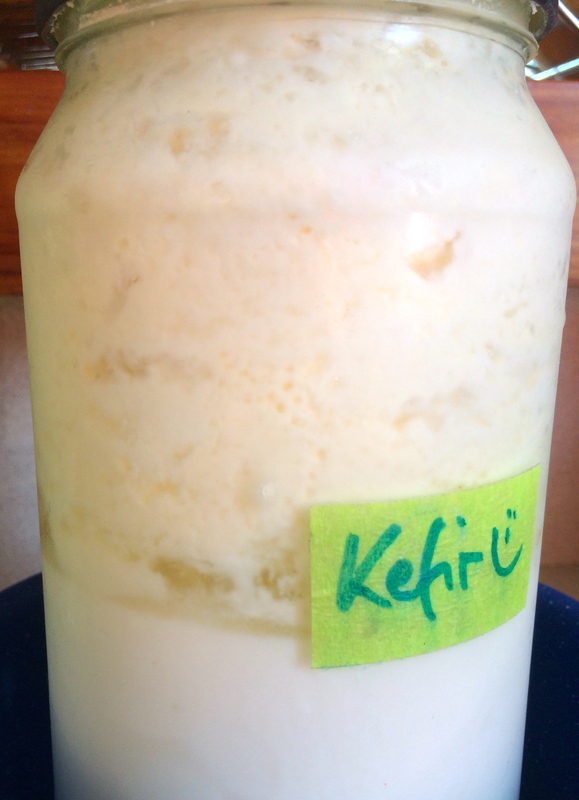 The coconut kefir that Anita and Terry make in New Zealand (in the same facility that René’s Kombucha is brewed, btw.) is made with the Body Ecology kefir starter. This is a laboratory made dairy-free blend of highly effective pro-biotic cultures. OK, enough Blurb! If you want to hear more and taste a whole variety of cultured foods and beverages I suggest you check out my Event Calendar, there should be at least one Traditional Cultured Foods demo & degustation class in the pipeline. If not, drop me a line and we’ll see if we can organise one in your area. Stir well in a 3 liter glass jar to dissolve the coconut sugar. Cover with a cloth and let ferment for 24-48 hours. Stir occasionally. Filter out the berries and bottle in plastic bottles. Store in fridge and wait 1-2 days for fizz to build up. The plastic bottles are essential! I know, I know… I’ve made a conscious decision to bottle my Kombucha in glass bottles. Yet plastic bottles allow you to gage the pressure building up inside of them. Glass bottles might explode if not refrigerated! I’m NOT kidding. Be safe! I have had more than one thick-walled glass bottle explode from too much pressure building up inside. 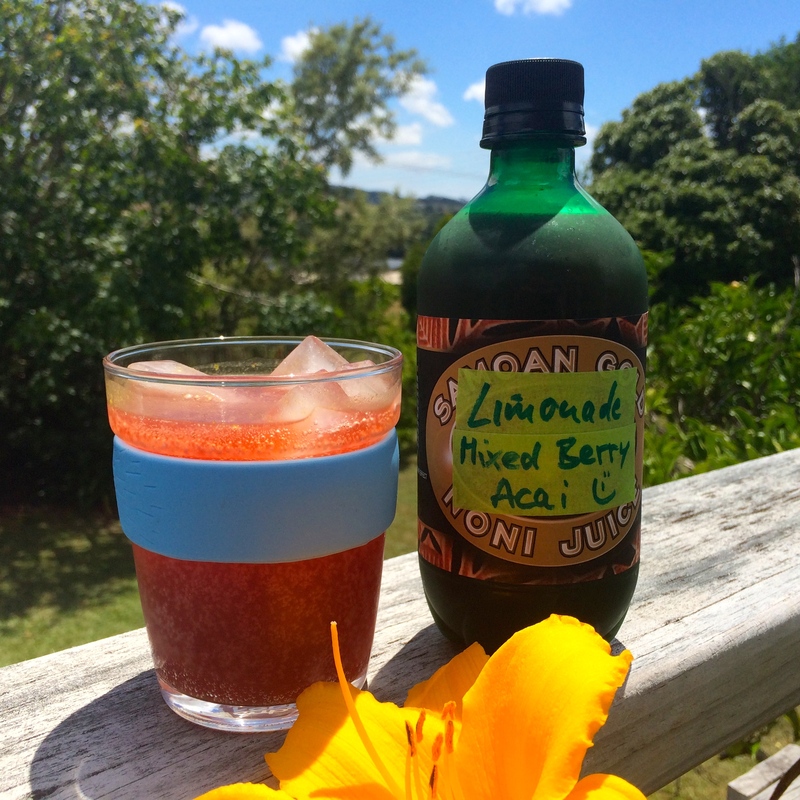 Collect/recycle plastic bottles from a local cafe and then re-use them for your fermented beverage projects! PS: Yes, due to the yeasts in the pro-biotic cultures your home-made limonade might have small amounts of natural alcohol in it. Now, you might be wondering, isn’t this a vegan raw food blog?! No, it isn’t. Although I’ve been following that diet for five solid years, from 2001 to 2006, I don’t any longer. 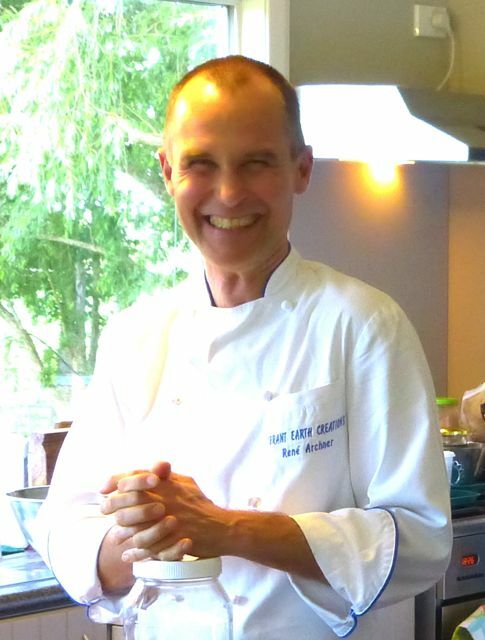 Yes, I still teach raw food classes and a full-on Raw Chef Training. Promoting raw food as a ‘lifestyle’ is just not what I do any longer. I firmly believe however in the empowerment that comes from knowledge and skills in the preparation of great food made from organic ingredients. That includes culinary pleasing raw food – especially raw desserts and snacks AND fermented/cultured foods!. In my own life, my wife Lydia and I are following more or less the recommendations of the Weston A Price Foundation (caffeine is the exception :-)). In my teaching I strongly support their views on nutrition – from personal experience. It only took me about two years and several lost teeth to eventually listen to my dear doctor, Damian Wojcik in Kamo, Northland. When he recommended to me to start drinking bone broth to improve the state of my dental health I somehow turned deaf. ‘Only’ two abscessed and a few more pulled teeth later I finally gave in and got myself some beef bones from the Kerikeri Butchery. Imagine a raw food chef: hat pulled down into his face, collar up, frequently looking over his shoulder, tip toeing into a butcher’s door. With hushed voice I asked for beef bones – and got given a shopping bag of bloody animal spare parts. Yes, at no cost! You will find that happen frequently too. Bones are not highly priced items at most butcheries. Lydia was the one who really got passionate about bone broth in the beginning. She bought a crock pot and made sure it was always filled with hot and nourishing stock – she had been a vegan for 24 years by then!!! Imagine being warm and nurtured and feeling it – from the inside. 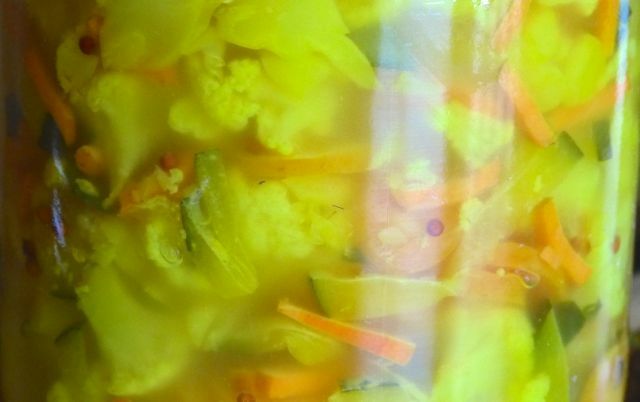 Nothing does that better than a cup of bone broth with a bit of pickle juice from lacto-fermented brine pickles! I won’t bore you with all the marvellous properties and benefits of bone broth. You’ll find a truck load of valuable information on the Weston A Price Foundation website or by reading Dr. Natasha Campbell-McBride’s book: Gut and Psychology Syndrome (GAPS). Before getting into the culinary territory here a quick glance at some logical connections: Upon her struggle with temporary infertility a smart naturopath suggested to our then raw vegan friend: “If you want eggs, eat eggs!” She listened and is now the proud mom of two strong kids! In a similar fashion, it strikes me as logical to think: “If I want strong bones and joints…” Before committing to painful and expensive surgical procedures on my joints (knees, hips, spine etc.) I personally would consider gelatine rich stock/bone broth an option. And yes, there is a difference between those vegetarian bullion cubes/powders and real bone broth. Often even the organic versions of these soup powders or pastes have a variety of dubious ingredients that can easily contain or camouflage MSG (like: yeast, hydrolyzed protein, spices…), a chemical you don’t want to add to any person’s diet. I personally stopped using these industrial bone broth substitutes. Try a good miso instead! And here is the recipe you have been looking for. Yield: Approximately 14 servings. This recipe makes approximately 2-4 liters of broth depending on the size of your crock pot. 1.5 kg of organic grass-fed beef bones, canon bones/leg bones are best and have plenty of marrow. Ask your butcher to cut them into pieces for you so the fit into your crock pot and you can access the marrow! Organic pasture-fed chicken necks and carcasses are inexpensive and also work great. 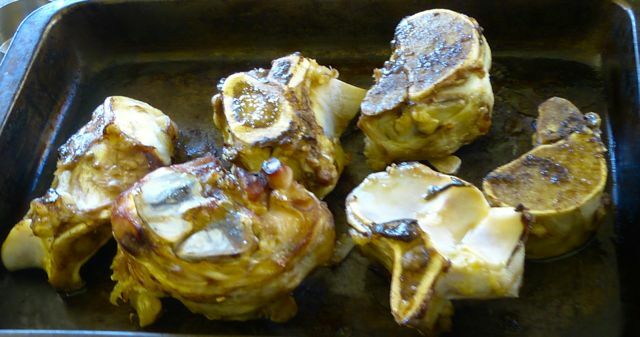 Brown or roast the bones bones first in a separate pan in the oven. It will caramelize the protein and give your broth a richer flavour. There is usually enough fat on bones to not require extra fat when roasting them. Spread them out on a baking tray and roast at 220°C for 4-5min from one side, turn the bones over and roast for a further 2min from the other side. Make sure NOT to char them! Place all ingredients in a crock pot and set the heat to HIGH. Bring the stock to a boil, then reduce the heat setting to LOW. Allow the stock to cook for a minimum of 8 hours. The longer it cooks, the better (up to 24 hours)! Strain the stock through a fine mesh metal strainer. Add any meat bits to a soup or eat them as they are. Place the hot stock into glass jars and seal them for storage in the fridge (for up to a few weeks). Let them cool down on the bench before transferring the jars to your fridge. 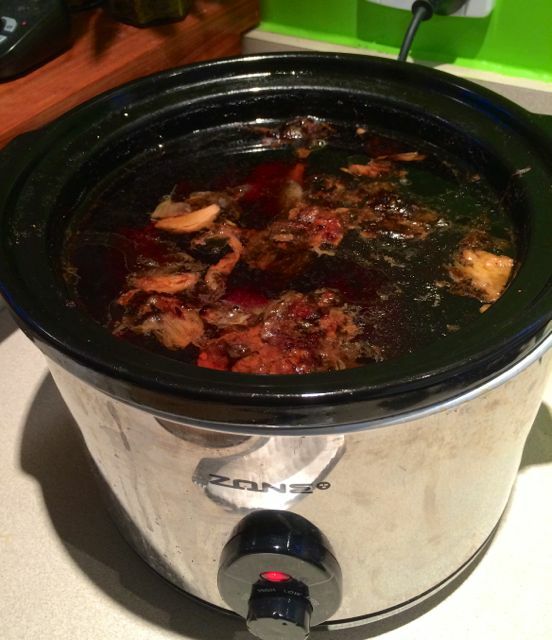 The bones can go back into your crock pot for another round – up to 12 times!!! They will release more minerals and gelatine with every round. Just add more apple cider vinegar and sea salt! After a few rounds you might want to add more black pepper corns and a few bay leaves. You will find that the jars with stock in your fridge turn into a firm jelly. That is caused by the high gelatine content! If you like, you can skim off any fat that has risen to the top and solidified – consider this “tallow” – and feel free to cook and fry with it or just leave it with your stock for the next soup! You can drink stock any time of day, before or after meals, or use it as the base for soups and stews! Perfect in any recipe that calls for broth/stock. 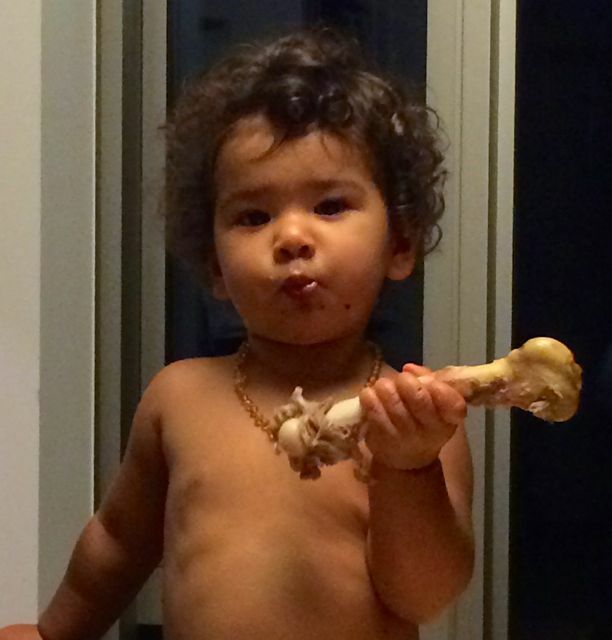 Use any other kind of animal bones you like – chicken, in fact, will take less time due to the smaller pieces. 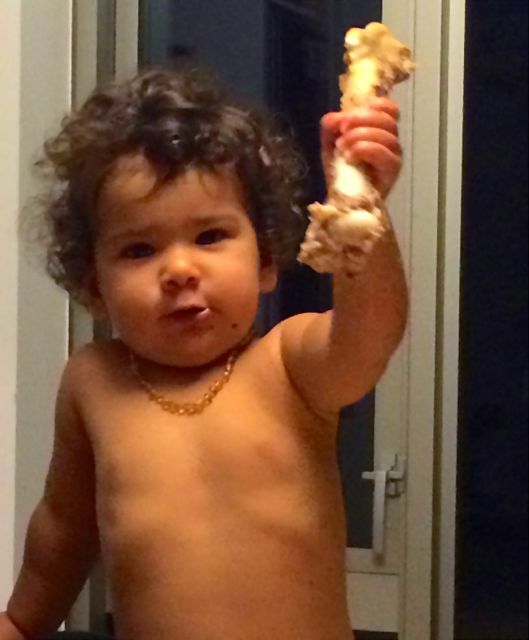 Chicken bones will fall apart after 3-4 rounds. You can add chopped veggies like carrots, celery and onions for more flavor or variety. Seaweed, especially Kombu, is a great addition to broth. For an interesting look at the mineral content of bone broth and the actual mechanism that makes it beneficial for building strong bones and joints have a look at this great article by Kaayla T. Daniel, PhD here! For an even deeper understanding I suggest you get yourself a copy of “Nourishing Traditions” by Sally Fallon or this little treasure here: ‘Nourishing Broth: An Old-Fashioned Remedy for the Modern World’. I’m going to blame this one on Sandor Ellix Katz and his infectious Passion for the realm of fermented food and drink. I have to say, I’ve caught the ‘Bug’! If you think my liquid fermentation experiments started and ended with this recipe here, you are wrong. Even my beloved wife Lydia is now drinking beer – the herbal home-brewed kind! It came to my utter surprise and DELIGHT that one could make beer from any medicinal herb or flower growing around one’s house and garden. 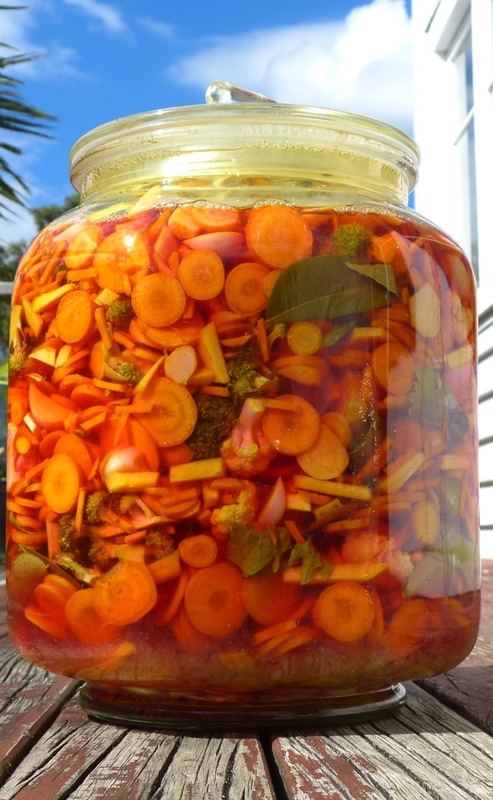 The fermentation process actually enhances many of the medicinal properties of plants. For a marvelous introduction to the subject, I urge you to demand this book from Santa: Sacred and Herbal Healing Beers, by Stephen Harrod Buhner. I’m not talking of the ‘buy-your-cousin-a-beer-making-kit-for-Christmas’ type of beer. These beers, and meads here, do not require hops or any other German purity standards. Simply put, these are sweet herbal teas fermented by beer yeast. Making tea isn’t that hard, is it?! Neither is brewing your own beer! 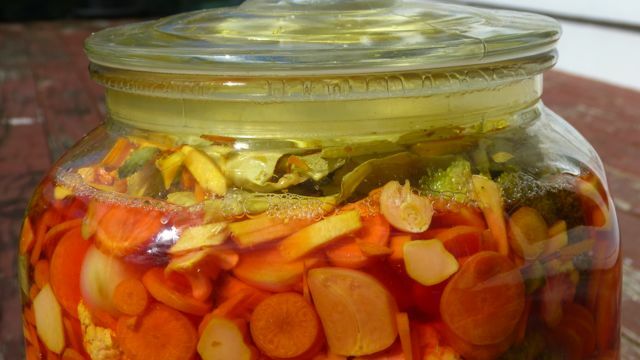 One issue I perceive with most people’s perception of fermentation is the fear of getting the ‘wrong’ bugs multiplying and of dying a mysterious death from it. Your chances of having that happen to you are a million times higher in a hospital near you than from your own alcoholic fermentation experiments! On that note: I strongly believe in ‘Simple is Best’, so I bought only one packet of beer yeast ever and just keep the yeast sludge from each brew for the next, beer or mead. Over time this will, in my arrogant opinion, accumulate a much stronger variety of yeasts (with wild additions from your home environment) than any store-bought package will ever supply. What is said above, in terms of simplicity, carries through this whole post. Do not get to hung up in the finest details of beer brewing, yeast and temperature control. Rather start playing in this new (actually: ancient!) medium and allow mother nature to guide you. That will come with a few messed up batches. I’d rather risk that than allowing chlorine bleach into our house. I could wax on about the finer details and different experiences, yet I feel at this point, you are actually ready to get cranking yourself. a 20l food grade plastic jerry can with srew cap and tap (recycled bulk dish soap or vinegar container from your local health food shop. Rinse well and extensively!) This will be your fermenter, see picture above! This recipe here was inspired by our orange tree going nuts with flowers (the one behind the bottles in the picture across the top of this page). To lighten its load a bit I picked a decent amount of them, juiced some tangelos from the tree behind our house, took the Auckland city honey from Marie-Christine’s bee keeper husband and went ahead. 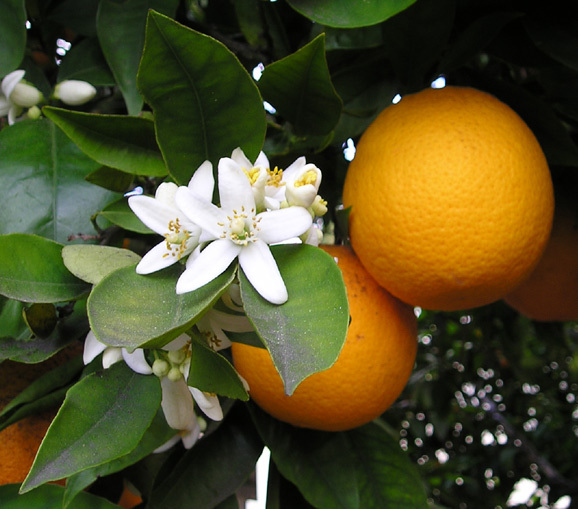 No orange blossoms in your garden or pantry? Leave them out or substitute with anything else, like fresh turmeric, tulsi tea, fennel flowers… get inspired! Put flowers and tangelo rind in a gauze bag. Place together with tangelo juice and honey into a 20 liter bucket. Add hot water and stir well to dissolve the honey. Keep temperature at or below 70°C! Now add black tea bags and let cool down. Once cooled to room temperature take out the bags with the flowers and tea and add beer yeast. 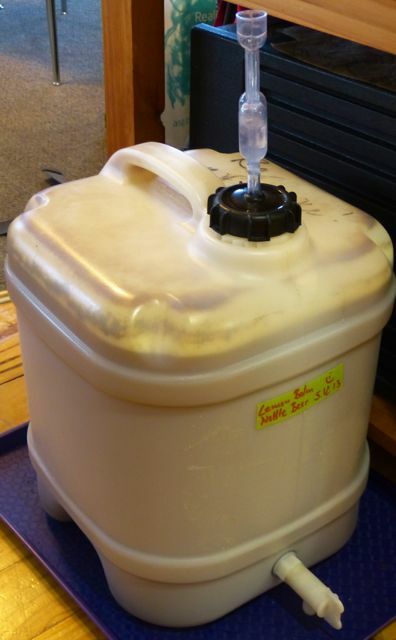 Transfer to your 20l jerry can and let ferment at room temperature for 7-10 days. Taste it occasionally! Once the intense bubbling/fermentation has ceased bottle directly from the tap of your fermenter, without additional sugar in the bottles (this will be a still drink). Let the bottles sit undisturbed in a dark and cool place to have the yeast settle and the mead mature. Keep the yeast sediment from your fermenter with some liquid in a 1 liter plastic container in your fridge till you are ready for another batch of beer or mead. The mead will get more dry and clear as it sits in the bottle. More flavour overtones will develop over the months to come. Store the bottles in a dark and relatively cool place. I have my collection under our house (no frost where we live). DO NOT SHAKE your finished mead bottles! The sediment is yeast and is best left alone. Enjoy and don’t worry! Have a home brew! KimChi – more than pepped-up Sauerkraut! At first I was concerned that all the spicy ingredients, which are natural anti-biotics would stunt the fermentation process. And yes, it slows the fermentation down a wee bit but not too much – if you leave it out at room temperature like sauerkraut. The batch in the picture above and to the left was made like sauerkraut and worked out perfectly. You have the option though to make the KimChi without adding the spicy chili paste to it initially. Let the vegetable mix ferment in peace first and store the chili paste in a thick-walled glass jar (it might burn holes in any fragile vessel *Twinkle*) Once the fermentation has stopped – after 3-4 days, add the chili paste to taste. The chili paste can be kept indefinitely in the fridge. Prepare the vegetables by massaging with sea salt like Sauerkraut. Add diced apple, orange juice, sesame seeds and Apple Cider Vinegar and mix well. Prepare chili paste in a blender and balance flavours. Keep the toasted sesame oil aside for later! Now mix some of the chili paste with the vegetable mixture and massage with your hands. Test flavour and add more if desired. Keep left over chili paste in a glass jar. Cover top with a layer of toasted sesame oil to prevent oxidization and store in fridge. This Kimchi can be eaten immediately. 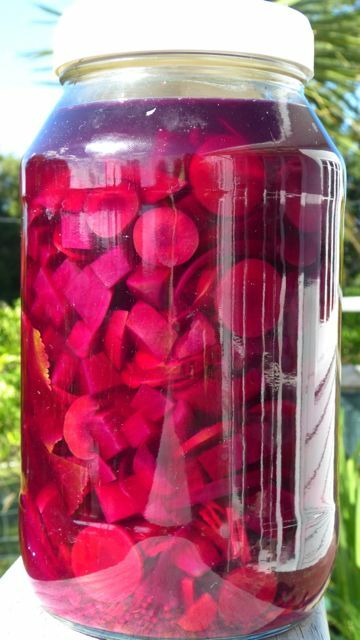 Stored in the fridge in a sealed glass jar it will develop a stronger flavour over time and even ferment. 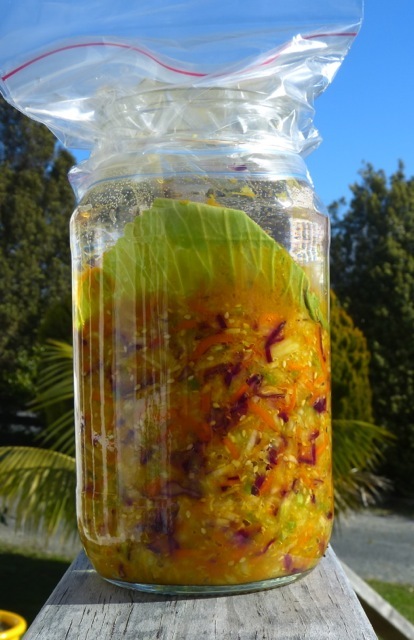 Alternatively weigh the top down as when making Sauerkraut (cover top with plastic bag to keep the bugs out!) and leave it sitting in a bowl to catch any bubbling liquids that might escape the jar (see picture below!) on your kitchen counter or in your hot water closet for a week or so. Then take the weight and cover off. Seal the jar with a lid and transfer to fridge. 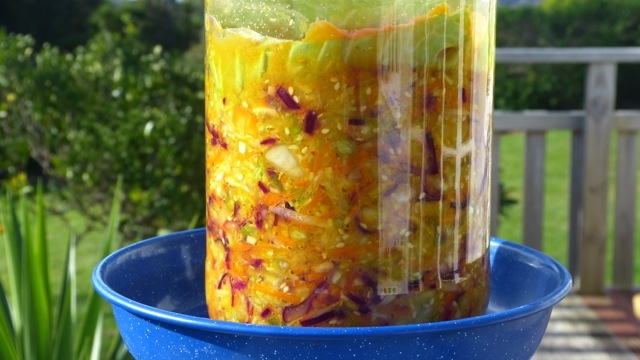 Alternatively ferment Kimchi vegetables first, like in the Sauerkraut recipe. After 3-4 days you can add the chili paste and transfer the jar into your fridge.